Trucking driving jobs still make an excellent career choice in 2018 despite the talk of autonomous trucks? Truckers are still in high demand and will be for at least decades to come. You can't beat a live human behind the wheel, too many variables to deal with. Safe, healthy, skilled drivers will always be in demand and can not be 100% replaced by self driving trucks. Questions: Will autonomous truck take over and kill all trucking jobs? Answer: I doubt it. Will they ever be used? I'm sure in 10 years or more they'll be used just not the way people (news media and companies) like to run their stories and press releases. They won't even replace 1/4 of truckers in 10 years. Natural question: How do you know? Trucking companies increased pay and bonuses in 2017 and 2018. Freight rates are up 1st and 2nd quarter in 2018 and the year is expected to be an even better year the the trucking industry. Update August 22: Today I went to price trailers (and see what trucks were available at Ryder) at several places. They don't have trailers available and new orders won't be filled until 2019 they are so far behind. Ryder has limited selection of trucks due to demand. Prices are skyrocketing on used equipment due to demand. The questions that you want an answer to is if you're compatible for the trucking lifestyle. We will help you figure that out below. Likely 2nd year pay $45,000 and up! You can be trucking on your own in less than 6 months. But first do a little research so that you make choices that are compatible for your situation. Truck drivers are skilled professionals. The more experience you have the better your skills behind the wheel will be but you can start right away with the right mindset and attitude about how you perform your job and safety! Guess what, that will help your job security pay! Ideally, you would have taken a look at the directions prior to going, during your trip planning, even if you use a GPS. Googling it or zooming in on GPS to see if the last turn is the right address helps. Calling the shipper/receiver in advance to compare directions could avoid a lot of trouble too. Main thing though, is don't be so committed to the GPS directions. Always look down street for low clearances, hanging branches, wires, etc. If the street looks suspect you shouldn't take the chance. Find somewhere to park and call the shipper/receiver to verify the correct directions. There will be different things that comes up requiring you to actually think and pay attention to details. This is one example but relax, this stuff is not rocket science. Just pay attention and think a little. If you're here reading all of this, you can handle it just fine! Trucks.com writer Clarissa Hawes talks about the ATA outlook for 2018. Truck driving jobs are here to stay. No matter how bad the economy gets you can be sure trucking companies are hiring all around the country. Many truckers were laid off or let go at the height of the recession but trucking companies are hiring again because manufacturers and distribution centers are busy again. Update: 7 years later.... This did happen a lot. A lot of companies went under a lot of bad and unhealthy truckers are out. This continues to evolve today. So.... truck driving is still a great career for the right qualified person as there will be plenty of openings and options to specialize after getting experience. 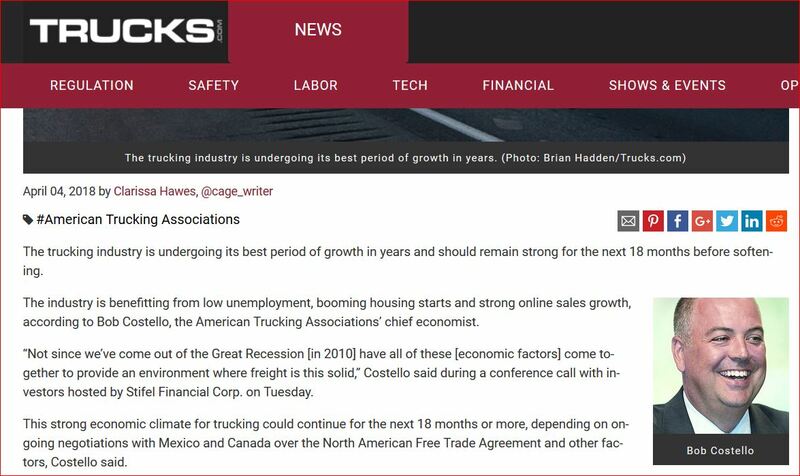 If you search for 2018 outlook for trucking you will see article after article about the positive expectations for trucking jobs. Answer: lol, There's no way for me to prove it to you but I will repeat this and respond lower down the page. Here's how I look at it. Humans can predict what other drivers or pedestrians will do only to a degree, you must observe, respond and/or adapt. Is it possible to write a program to accomplish this yes. Is it easy to write it and anticipate it's performance while interacting with million of humans on the road? It's almost impossible because of the many various driving still and types of choices people make due to different ways of thinking. So that means either most of these trucks will need to run together with no humans on the road or they need to have a seperate highway system so that they can run in groups as much as they want. Then each unit can respond perfectly with each other because they can communicate and operate in sync. That can't be done with a mixture of humans and vehicles. The most common trucking job that you are likely to start off with is pulling a dry van over the road. Those are the plain box trailers that you see most often being pulled down the highway by a big truck. It is the cheapest freight to haul and usually requires no special attention unless placarded. This means the average pay is normally the lowest pay for truckers naturally though, it is where most drivers begin their careers. Notice I said "over the road." That is because as a new trucker, over the road for 3 or 4 weeks at a time is most likely how you will start your career. Despite what your person of contact at the company might have told you during the first conversation. You must ask correctly. Now you can possibly start with other types of trucking jobs that won't keep you out like that. It varies among trucking companies. Small or medium sized trucking companies or those hauling freight from a local manufacturer or distribution center that sends trucks out and gets drivers back in to do it again is where I have found the most success. 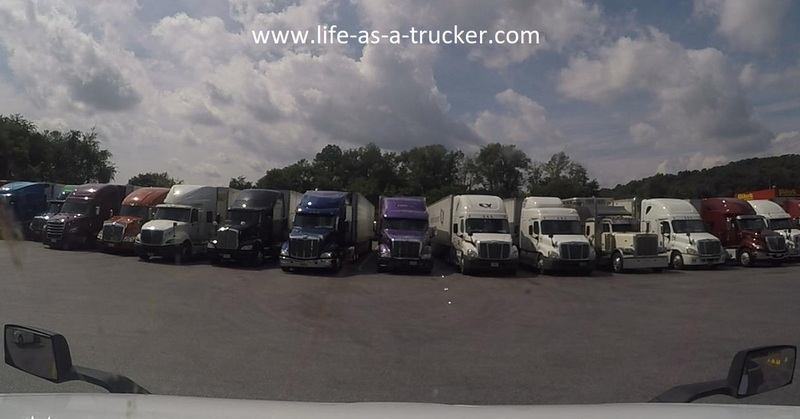 Learn more about small or medium sized trucking companies here. OTR or Over the Road - The easiest and most likely for new drivers. Some of you have been told that you would be able to find a local trucking job straight out of trucking school. You probably got information from a recruiter at a trucking school or trucking company when you called a number on a flyer or in a newspaper. Those jobs are quickly filled by experienced drivers wanting to come off the road and you are stuck with those OTR (over the road) jobs that they left. The easiest or quickest way you will get a trucking job fresh out of school is with one of the larger carriers that most other folks go to right out of school. It is not the only trucking company that will hire you just the quickest. Again, it's not impossible to find other a local trucking jobs or trucking companies that will run you back in every weekend. Especially if you live in a large city or one with a lot of manufacturing. I just don't want you to based your entire decision to spend the money for trucking school on the idea that you will definitely find a local trucking job or dedicated route if you have not gotten that position guaranteed to you by the trucking company itself in writing. Check if there are local jobs in your area right here. The better higher paying truck driving jobs are usually with companies that make or sell their own products and have their own trucks and hire their own drivers. Sherwin Williams, Wal-Mart, Poly Corp, Ashley, etc. To get these truck driving jobs you will usually need experience of at least 1 year (up to 3 is not unusual) and a clean driving record. That's why you will always hear me tell new drivers to try and keep your driving record and in the best standing as possible. Otherwise you will not get these high paying trucking jobs. Some of you will love your first trucking job just fine. It all depends on how well the trucking company is operated, the location in reference to your residence, the specific driver's needs and the relationship with office personnel. Oh and the competency of office personnel. When and if you do get into trucking, you want to take pride in your job performance and represent your company well. Your history will go with you and open doors or keep them shut. If you take pride in being a professional trucker you will have a career. If you don't, you will always have a job and not a career because you won't be able to go to the best trucking companies. Here are some tips to make trucking a career and not just a job. Keep your eyes open for that ideal trucking job for your situation but don't change trucking jobs for a few pennies or just because you can. You probably notice by now, there are many different types of truck driving jobs. The type of trucking job you have will help determine how long you stay out, whether you touch the freight or not, how much your paid, the benefits, home time and probably other factors that don't come to mind right now. I already told you that it is likely you will get the most common trucking job straight out of trucking school. the biggest reason that I want you to look at the types of trucking jobs though is to know what your shooting for after getting experience. Plus there are a few more options to you right now as a new trucker such as refrigerated, flatbed, tanker and even moving company. For more details on those types of jobs, there is a link below. But first...if the information on this page helped you, please like and share it. Thanks, it helps me to keep updating the website! Do you need to find a better company or do you think your company deserves to be listed with other recommended companies. Please let us know if you are working for a good company. 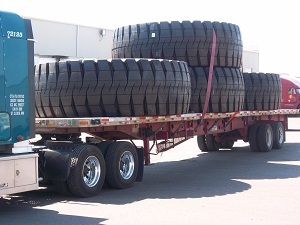 Where is your company out of and what type of freight do you haul? Silver Transportation - We give you that 2nd Chance ! W. N. Morehouse Truck Line, Inc. They would be about a 7 because of their great pay. Do you know if May Trucking is a good company to work for? 7 it is a good pace to work and is always looking/checking in to make sure you're okay on the road. 8- Great company to work for. Brand new Trucks, regional work, pay is great. they are hiring now for flatbed truckers! 10. Great company to work for, excellent!